Check out our college partner sites to register today! 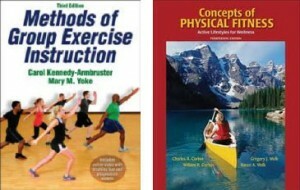 Course Textbooks: Methods of Group Exercise Instruction, Second Edition, Carol Kennedy Armbruster & Mary M. Yoke & Group Exercise Cardiovascular Fitness: Supplement Reading from Concepts of Physical Fitness: Active Lifestyles for Wellness, 16th ed. 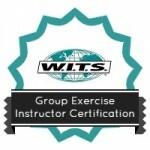 Course Description: Experience a group fitness course like no other! Optional formats based on the college preference of 5, 8 or 12 weeks of intensive training will help you to develop skills for leading a group to the best of your ability. The program will include lecture materials, practical lab demonstrations and interactive participation. Lecture materials will cover the essentials of group exercise history, music, choreography, safety techniques, as well as basic applied science specifically relating to group fitness cardiovascular, muscular, and flexibility health. Practical labs will expand into skill development for functional training, sports conditioning, circuit, boot camp, dance, step, kickboxing, hi-low, aqua, indoor cycling, and equipment-based class techniques. A mind body overview in Yoga & Pilates will cap it off so you can incorporate this knowledge into sections of your traditional class formats. Passing this group fitness course will provide students with a certification and skill set for private & public fitness centers. It is perfect for those passionate about starting a part-time or full-time career in fitness or improving their own exercise experience! Special Note: The written and practical test voucher / exams are included in this course on the 6th week. Level 1 Certification: Current CPR/AED certification and pass both written and practical certification exams. Level 2 Certification: Level 1 plus completion of a 30-hour internship. Discuss the evolution of group fitness. Conduct health-screening assessments appropriate for a group fitness environment. Determine appropriate and safe exercise movements & intensities. Apply principles of group cohesion to group fitness. Safely, incorporate music and sound into a group fitness program. Describe the basic anatomy as it applies to each class format. Discuss balancing body mechanics & musculature. Correctly cue, perform, monitor and design exercises for a group setting. Demonstrate warm up and cool down movements and stretches. Apply principles and methods of group exercise to alternative formats such as sport conditioning, functional training, indoor cycling, kickboxing, step aerobics, equipment-based classes, and lifestyle type classes. Demonstrate motivational strategies to encourage group exercise participation. Create, demonstrate, and lead a group exercise class with personality, safety, technique, & an expansive knowledge base. W.I.T.S. is a member of the International Association of Continuing Education and Training (IACET). The American Council on Education has recommended 3 undergraduate academic credits for students who complete the full program including the 30-hour internship. Discussthe image of a fitness instructor as a role model. * Labs will cover hands on activities in these chapters. Enjoy a general group exercise (GX) class format. Conduct a HSQ, informed consent, and PAR-Q. Assess risk factors for cardiovascular disease. Describe group cohesion tactics and creating a healthy environment for the participant. List examples of student-centered and teacher-centered instruction. Demonstrate and calculate resting heart rate (RHR), HR max, and HR reserve for various scenarios at both the carotid and radial pulse. Administer accurate fitness assessments (YMCA 3-minute step test and 12-minute run or walk test). Participate in a YMCA 3-minute step test. Define the five components of a class and have the tools to develop a well-rounded warm-up. Analyze the traditional GX warm-up and participate in a sports conditioning warm-up. Describe the differences between the traditional and sports warm-up. Define terminology for muscular conditioning, roles of muscles and muscle actions. Define terminology and demonstrate examples for joint actions. 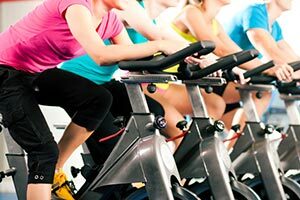 List the five categories of exercise class evaluation. Develop a warm-up routine that includes dynamic and static stretches, rehearsal moves, and gradually increases the HR. Identify the beginning and end of an 8-count and 32-count musical phrase. Identify musical phrases of 8-count and 32-count patterns in various pieces of exercise music. Explain how to identify a downbeat and upbeat. Feel comfortable leading a group through a warm-up. Explain how muscles work in pairs to produce movement and stabilize joints. Describe common muscle imbalances and their causes. Identify the names and locations of major muscles and joints, and their actions. Identify exercises associated with each muscle group. Demonstrate simple 2-count and 4-count choreography segments, using a variety of movement options, as well as arm and foot patterns. Construct a simple combination of four 8-count phrases, transitioning smoothly from one phase to the next. Demonstrate fluid transitions between choreography segments. Demonstrate verbal and visual cueing skills. Match upper and lower body movement patterns. Define the appropriate selection of GX music based on beats per minute (bpm). 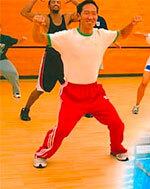 Participate in a step and kickboxing demonstration. Develop an appreciation for developing choreography for step and kickboxing. Participate in an instructor led warm-up. Practice monitoring exercise intensity during the cardiovascular component. Demonstrate stretches for major muscle-joint complexes. Differentiate between dynamic and static stretching. Identify appropriate scenarios for dynamic versus static stretching. Develop an understanding of an appropriate cool-down routine. Develop choreography for an appropriate cool-down including dynamic and static stretches. Demonstrate a simple 32-count, 4-phrase combination with correct cueing and musical interpretation for a cardiovascular cool-down. Participate in a muscle conditioning demonstration. Participate in a sports conditioning and functional training demonstrations. Describe proper safety and technique for muscle, sports conditioning, and functional training. Identify markers associated with proper body alignment. Describe the safety and technique for Pilates, yoga, cycling, and aqua. Identify common errors in exercise execution for Pilates, yoga, cycling, and water aerobics. Demonstrate the basic skill set for Pilates and yoga to incorporate mind and body techniques as a portion of GX class when needed (on occasion). Understand that additional certifications are necessary to teach Pilates, yoga, cycling, and water aerobics on a regular basis. Continue building confidence in front of a group. Explain the practical testing format. Create a group exercise class, using all five components of a traditional GX class. Utilize music to establish the tone, tempo and pace of a GX class. Design simple choreography patterns that conform to eight- and 32-count phrasing typical of GX music. Transition smoothly from one movement pattern to the next. Design a balanced and productive muscle-conditioning segment. Lead a class through all five components of a traditional class, including warm-up, cardiorespiratory conditioning, post-cardio cool-down, muscle conditioning and flexibility/cool-down. Satisfy the evaluation criteria as outlined in Group Exercise Class Evaluation Form, Methods, Appendix A. Add this cutting edge resume building group fitness certification with 2 Levels. Experience a comprehensive group fitness exercise course like no other! Whether the 6 or 9 weeks of LIVE intensive training, this unique program will help you to develop skills for leading a group of exercisers. The program will include lecture that encompasses learning essential aspects of the human body and their effects from exercise. The live hands on in-person practical lab demonstrations will bring to life the qualities of a good safe group exercise leader. As a result of these features, this course is all about active participation. Passing this group exercise course will provide students with a national group fitness certification Level 1. Even more, this certification can help your career, add variety to clients, and increase your value and ultimately your income. Test vouchers ($350 value) are included at our licensed and hosting colleges! “Bonus Digital Badge Free” with successfully completing the program! Test Voucher for the written and practical skill exams to be awarded the Level 1 Group Fitness Instructor Certified credential! Lead a group in a class to qualify your practical skill competencies. Experience in the field action with the optional 30-hour internship to bring it all to life and earn your Level 2 Group Fitness Instructor Certified credential. The course is taught in a 6 or 9 week LIVE format depending on the college scheduling. Grab your online study tools for only $75.00 if you are a registered student at one of our partner colleges! Location registration pages with a college near you! Don’t see what you want? We are adding new sites every month. Call us at 888-330-9487. View W.I.T.S. student testimonial videos on YouTube. Special Note: None of our educational programs are required to test for any national certification or certificate. Note: This program has not been applied for the NCCA credential. This program does carry college credits & professional CEC’s for its comprehensive value to help a candidate to master the essential areas of this profession to help clients improve their health goals.